Maybe there is more than one workshop in town but it seemed when I arrived that this was the heart of the matter. This is particular, looking behind the apparently run down exterior there was an intent industriousness underway. My brother is a mechanic, I know this work, manual labour, requiring muscle and tough hands, as well as an attention to detail and a great deal of inventiveness. Maybe less so in Europe now where a programming degree might be more helpful but this is Cuba. Parts are often impossible to find, there is no interest free loans and a trade in every 3 years for a new car. People make do with what they have, even a beaten up old Lada means freedom from an uncertain public transport system, status and the ability to earn money. 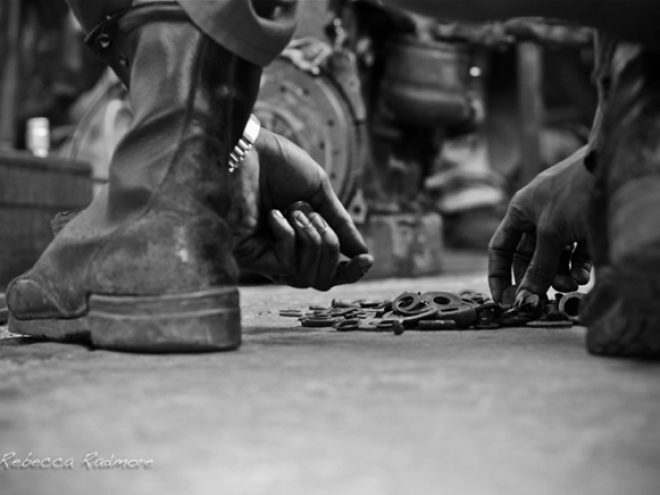 The mechanic there is a gate-keeper, an enabler to a better life. In translatable terms what he earns would not rise above a pittance outside of Cuba but inside it is a good job, a good living. In a funny way it is also a clean living, an engineer working for the state might have to hustle to get by, a particular mechanic is rewarded for what he does. Appreciated, respected. Just so long as he can get the engine running, time has a value here but its all relative, getting that engine working is what counts is it takes a day or a week or a month. I see them finally turn over what had seemed mission impossible, it worked, it did not quite purr but the engine was working. Finally. Amazon.Com doesn’t do deliveries to Cuba, Home Depot has yet to open a store and realistically waiting for the state stores to have the part you want is about as effective as waiting for the proverbial Got. El Tornero (the metal worker) has therefore to be an ingenious fixer. The best ones have a steady stream of clients who bring problems to be solved, bring the most obscure parts or a drawing or an idea and rest their hopes on the shoulders of El Tornero, perhaps whispering a prayer to Ochun on the way in. My guy is patient, careful, insightful, things do seem to get fixed, get made. It seems a cliché to say that there is a point and a use for everything but it seems that way here…I like him. El Chino has worked in the painting and decorating industry for over 40 years. He has been involved in construction projects across the island, including Varadero, where he worked on the new hotels that would support the towns booming tourist industry. At 63 he is currently running a one-man show, building a roof extension on the Pena Heredia residence. With dreams of a film and music studio above his home, Mr Heredia lives in the UK and sends money back to Cuba to keep the El Chino’s construction work going. El Chino is a quick and meticulous worker and seemed in such a hurry to get on with the job that his consent to my photographing him was a quick nod and a back turn. I tried to get him from as many angles as possible, below, from the roof, through a window, but I felt that I wasn’t close enough to my subject. When I noticed him going for a quick cigarette break on the roof, I took my chances to join him for some conversation, which was when I was able to take some of my favourite photos. Since his hands were white and there were sacks of cement behind him, you can still work out his trade from the photos. In contrast to the mechanic, here the most difficult task was to get phsically close to the subject, since the scaffolding he was standing on really didn’t seem safe for two! It also taught me a lesson in preparing myself for changing light conditions and dealing with extreme contrasts. Getting my hair cut on a trip to California recently I ended up in HairLand, a franchise of what appear efficient and productive hair saloons, offering you a premium stylist for an extra US$ 3 only. The best barbers in Old Havana are about as far as you can find from this. Indeed when I walked into Jose’s barber-shop it was so pitch perfect it seemed fake, a trick, a set up. Cut-throat razors, banter and a worn down exterior that hasn’t need painted for 20 years. His demeanor was menacing, threatening until he laughed and with tenderness held his clients face in the right position or took a break to feed his son or coo his little dog. Rebecca Radmore is a documentary photographer and visual story-teller. Born in London, UK she studied Latin American Studies at UCL, was awarded a scholarship to study Documentary Direction EICTV Film School in Cuba, and is currently working towards a Masters in Documentary Photography and Photojournalism at London College of Communication. Her professional life has also greatly influenced her work, focused mainly on designing and implementing local community development practices in the UK, Europe and Latin America. Rebecca not only uses photography, film and conversation as a way of gaining a deeper understanding of the people and communities she meets, but as a tool encouraging dialogue about ourselves and the society we live in.